I modified my Decmber 2012 abstract to create this abstract for the new group , Cronic Invisible Illness, and SeCoNdSyLvIe (a group admin). I deliberately softened the colors to signify the hurt people have with a cronic invisible illness. They are not always cheerful, and colorful. This group is a SUPPORT GROUP for all people in FLICKR who suffers from Chronic Invisible Illnesses.......the list is long....and who want a SAFE haven from being labelled, discounted, invalidated or made into a pariah. DISCUSSION in this group has been made private. WHO SHOULD JOIN - people with Chronic Invisible Illness and their friends and families and supporters. 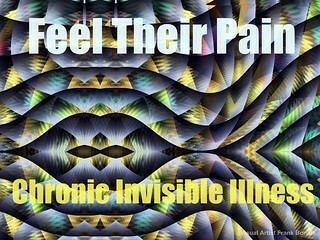 Examples of invisible conditions are arthritis, asthma, brain injury, chronic fatigue syndrome, chronic pain of most types, Cushing's syndrome, cystic fibrosis, diabetes, endometriosis, heart disease, lupus, Lyme disease, Meniere's disease, migraine, multiple sclerosis in the early stages, neurological and seizure disorders, osteoporosis, organ transplant, and Parkinson’s disease.